Cantering up to the T fence, it didn’t look that big. Then we took off and I was like “Oh, that’s wide AF!” but by then we were already over it. Yay for not looking at fences before you jump them! Then you don’t know how big they really are. As wide as Bobby is tall. This is what we do in our free time. In general the schooling was a really good day. Henry started out a little bit spooky (I have no idea why he’s spooky at this venue, he’s normal everywhere else) and I was trying to showjump canter everything, but once I let him go forward it was amazing how things actually worked out. Duh. The word of the day was “allow”. Half halt with the body but allow the horse to keep coming forward to the fence. We need to school XC more so I get better about remembering this. We strung together a few BN and N fences to start, then went to the water and jumped the BN, N, and T routes through there. No problem with that stuff. Then up to the big mound taking the N route and circling around to the big Training hay feeder thingy. He peeked at that off the ground a little and I gave him a tap on the shoulder, then galloped around and he jumped it well the second time. 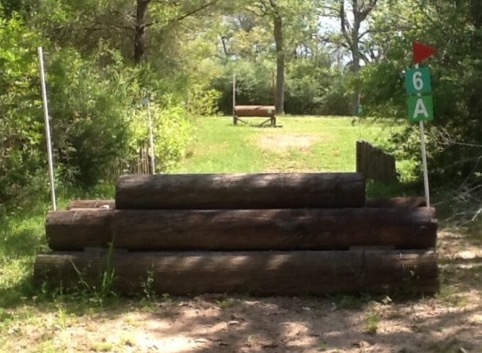 In retrospect, that’s the biggest XC fence he’s jumped to date and it’s kinda spooky, so I can see why he gave it a little peek the first time! Then we went over to an open ditch that was probably the deepest Henry has ever seen, AND it had water in it from recent rains. He’s jumped a few open ditches and several Trakehners but nothing quite this deep and dark. All the horses were a little spooky at it but with some encouragement and repetition it smoothed out. Henry was definitely looking down into it but he went. Once Trainer said “just ride it like a canter stride” something clicked in my brain and ta-da: it rode perfectly. Just like a canter stride. It’s amazing how sometimes all it takes is the right words… that’s how she fixed my down bank issue too. I think she’s a wizard or a voodoo queen or a unicorn priestess or something. 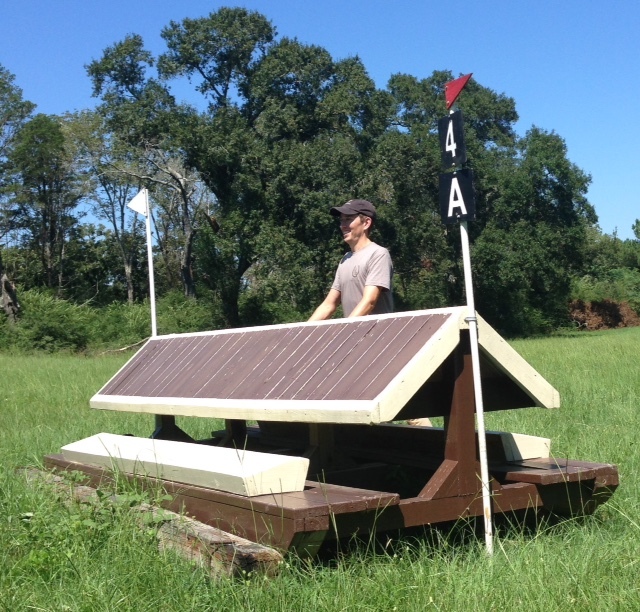 After the ditch itself was smoothed out, we jumped the ditch with two strides to the prelim log stack. It wasn’t very big, probably only 3′, but it’s the first ditch combination Henry has ever done. The whole thing took a few more shoulder taps but once he figured it out he was super game, locked on, and went right through. All the shoulder taps he’d received up to this point (oh, what… 4 or 5? Henry says it was a million) had gotten him a little upset so we took a minute and relaxed and I made a big fuss over how good he was while he velcroed his brain back in place. Poor boy, those hamsters in his brain were working on overdrive the whole day. We ended the schooling with a trip up and down the banks, both of which he did perfectly on the first attempt so we let him be done with that. Mentally he was at full capacity for learnin’. On the way back up the the barn Trainer and I discussed my plans for the future. I had intended on cornering her after AEC and giving her my 2 year plan (nope I’m not That Weirdo at all, I dunno what you’re talking about) but she beat me to the punch. I was happy to hear that her timeline for a move-up was actually even a bit ahead of my own plan, and that she approved 100% of the Novice 3 Day at Coconino. Will we run a Training before then? She thinks it’s possible. We’ll see how things work out. A lot will probably depend on how wet and miserable this winter is… if we can’t ride, ain’t nothin’ gettin’ done. Until then, I’m super pleased with the progress we’ve already made in Henry’s first year as an event horse. On to the fall season… starting with AEC NEXT WEEK. AEC has snuck up on us! You guys are gonna kill it. Those jumps are HUGE. BN will be like little sticks on the ground in comparison. This! Henry eats BN courses for breakfast now. 6′ maybe? Somewhere around that. That’s why I thought. You both are way braver than I! That training jump … NOPE. Pretty cool about riding the ditch like a canter stride though and that Henry is basically jumping ALL THINGS now. Well the ones at AEC will be tiny so then you can switch your comment to “awww, that’s a cute little jump”. AEC BN jumps are gonna be tiny after jumping those this weekend. Henry rocks! That Training fence looks FUN! Look at you guys go! And yeah, not jumping anything you posted pictures of. NOPE. lol go Henry gooo!!!! what a good horse and awesome schooling. i hope you guys KILL IT at the AECs next week!! Wow! Good for you and Henry for being so fearless!! I am impressed, as always.